Opener art only from Wiki.How. This image depicts how spatial data is being used to track spouses and partners. It is one of the socioethical scenarios included in this book chapter. Location-Based Services (LBS) provide value-added solutions to users based on location or position information and other contextual data. They enable the collection of GPS data logs or location chronicles, and may be deployed on a range of devices, many of which presently come in the form of commercially available product solutions with corresponding applications. This chapter presents the outcomes of an observational study of LBS uscesers, which was designed to gauge user perspectives in relation to LBS socio-ethical dilemmas. The focus is on the outcomes of a spatial analysis exercise, which resulted in the development of a series of scenarios (in map format) that demonstrate varying LBS usability contexts. The scenarios range across various risk levels, and can be used as further input into consultative practices that are centered on the socio-ethical implications of LBS usage. Additionally, the results of the LBS observational study can be utilized to inform the need for LBS regulation. Future research directions are proposed, allowing for the study to be extended to wider contexts. Location-based services (LBS) provide value-added solutions to users based on location or position information, and on other contextual data. They enable the collection of GPS data logs or location chronicles, and may be deployed on a range of devices, many of which presently come in the form of commercially available product solutions. These include, but are not limited to, in-car/vehicle data loggers, dedicated handheld or wearable GPS devices, and GPS- or location-enabled smart phones. In considering the socio-ethical (including privacy and security) issues pertaining to LBS usage, it is important examine user perspectives regarding the technology, and in particular their attitudes regarding location disclosure. This chapter presents a series of socio-ethical scenarios that allow such attitudes to be gauged, thereby spatially reporting on the outcomes of an observational study of LBS users, previously analyzed in Abbas (2010) and Abbas (2011). A summary of this earlier analysis is offered, and a series of spatial maps are put forward as an alternative, visual, representation of the thematic outcomes. Future research directions, such as the regulatory and public policy implications of the study, are discussed. This chapter, in essence, focuses on the socio-ethical dilemmas associated with LBS usage, from the perspective of the users themselves. Literature in this domain is primarily focused on location disclosure amongst social relations, such as friends and family, and specifically on the willingness of users to reveal location information to individuals, both within their social circle and extending also to strangers. Prior ethics and social implications literature address the complexities associated with the themes of control, trust, privacy and security. These complexities arise from the intimate relationships between those themes and their sporadic presentation in relevant scholarship. There are few studies that simultaneously cover all four themes. Specifically, there is a lack of research that covers the socio-ethical dilemmas and usability related factors of location tracking and monitoring. Whilst previous studies have addressed one or more themes related to control, trust, privacy and security, in many cases they have not done so concurrently and/or explicitly. Several studies have, however, been conducted that concentrate specifically on the attitudes of users with respect to location information disclosure, monitoring and tracking amongst social relations, which may include friends, parents, other family members, employers, and strangers (Levin et al. 2008, pp. 81-82), all of whom can be considered “friends” in the social networking environment. A major focus of these studies is on the collection of GPS/location data, and on the readiness of a user to disclose location information to members in a given social context, in addition to the consequent social implications of revealing such sensitive personal location information and of tracking activities in general. These studies have been identified and discussed in Abbas (2011), and are summarized in Table 1. It is noteworthy that this chapter is not intended to provide a complete literature review on location disclosure amongst social relations; rather a number of representative examples are given. When collectively compared, the studies reveal common methodological characteristics; that is, the majority of the research is focused on some form of observational or field study, in which location information is gathered using a suitable LBS application and usability issues are examined, after which a reflection or interview process follows. Thus in examining control, trust, privacy and security related issues, any study on LBS socio-ethical dilemmas must address issues of usability and location disclosure amongst social relations, thereby enabling the themes and associated socio-ethical challenges to be practically, as opposed to theoretically, explored. For a detailed discussion of literature pre-2011, refer to Abbas (2011). Further studies in this field, published since Abbas (2011), have persisted in a similar manner, examining location disclosure in relation to a particular theme, and/ or a specific social relation. In terms of theme, studies based on privacy calculus models are prominent. Two common and demonstrative examples are offered. Sun et al. (2015) maintain that individuals’ willingness or intention to disclose information in the location-based social networking (LBSN) environment is relative to the link between perceived benefits and the possible privacy threats, whereby gender specific differences play an important role. The authors provide a review of literature on information disclosure and privacy, and their interview-based study employs the privacy calculus model to quantitatively understand information disclosure intentions. Zhao et al. (2012) similarly utilize a privacy calculus model to assess disclosure behaviors in the LBSN environment, reporting that the disclosure of location-related information is relative to perceived benefits and privacy risks. The results of Zhao et al.’s study show that the existence of privacy controls and privacy policies aid in alleviating users’ privacy concerns. More recent research into location disclosure amongst social relations follows a similar approach to those summarized in Table 1. For example, Bentley et al. (2015) present a system for location-sharing between “strong-tie social relationships” (Bentley et al, 2015:4) i.e. friends and family members, to aid in planning and coordinating location-related events. The study provided the option for the participants (20 in total) to record a voicemail diary at the end of each day, and an interview was conducted at the completion of the 21-day exercise. Bentley et al’s study found that certain features of the application were beneficial and decreased stress levels, and while privacy was raised as a possible concern it was not particularly prevalent given that the social relations of interest were friends and family members. It is evident in recent studies, however, that there is an increased recognition of the need to concentrate on participants from diverse age groups. For instance, a study by Thomas et al. (2013) recruited 86 participants from the older adult population for a one-week LBS usability study, requiring participants to complete questionnaires prior to, and post, LBS use. Detailed interviews were also conducted for 20 selected participants. The study focused on the concerns of this participant group, and whereas participants were initially concerned about the privacy-invasive nature of the technology prior to using the technology, they were less so after usage. However, other concerns were also expressed, in particular, a perception that the technology would be considered, not as socially positive, but rather as assistive, implying its user’s infirmity. In all of the aforementioned studies, there is an apparent lack of examination of the spatial component; that is, the power of geographic information system mapping has not been harnessed, particularly as a means of analyzing the location chronicles of users (where collected) in order to emphasize thematic and descriptive findings. Explicitly, the use of spatial scenarios and illustrations in conjunction with the thematic mapping presented in Abbas (2011) is yet to be explored. This chapter attempts to build on the original thematic mapping exercise by demonstrating the merits of spatial analysis and mapping in understanding the socio-ethical implications of LBS, as articulated by LBS users. Prior to presenting the spatial analysis technique and corresponding maps, a summary of the thematic results, published in Abbas (2011), is provided in the following section. Consolvo et al. (2005) Users’ willingness to disclose location information to individuals in their social circle & the ensuing privacy implications. Three-phased study utilizing experience sampling method over two-week period, requiring users to respond to hypothetical requests, diary component and reflection task. Michael et al. (2006) Implications of GPS monitoring on an individual. Recording of GPS data log over two-week period, while simultaneously reflecting on the process through daily diary entries. Anthony et al. (2007) Users’ readiness to disclose location information, upon receiving requests, in specific contexts and with various individuals. Employed experience sampling methodology over one-week period, in which participants were asked to respond to pager requests by completing the corresponding questionnaire, after which an interview was conducted. Brown et al. (2007) Trial of the ‘Whereabouts Clock’ (WAC), a device that provides family members with location details about each other, to determine attitudes regarding usability, tracking and integration into specific households. Tracking of family members using mobile phones over six-month period, where location information was displayed on the WAC. Supportive interviews were performed at oneweek intervals. Iqbal & Lim (2007) The privacy risks of GPS data collection and profiling using telematics systems. Experiment involving collection of GPS data from volunteers and analysis/ processing of this data to generate profiles and draw inferences. Barkhuus et al. (2008) Trial of ‘Connecto’, a friend-finder application running on a mobile phone that enables automatic location & status updates amongst social groups, to reveal nature of usability amongst individuals and impact on behavior. Two-week study conducted, in which participants were required to integrate the application into their daily life, while completing a daily diary entry and two interviews at oneweek intervals. Seeburger & Schroeter (2009) Usability & functionality tests of ‘Disposal Maps’, a mobile-phone based location sharing software. Usability tests were performed over three-week period using iPhone running Disposable Maps application. Toch et al. (2009) Trial of ‘Locaccino’, a Facebook-based LBS application facilitating location sharing amongst individuals, to examine their sharing preferences and privacy settings. Phased field study over four-week period involving a survey prior to the trial, deployment of application, use of application and survey at conclusion of trial. Tsai et al. (2009) Trial of ‘Locyoution’, a Facebook based location sharing application with an additional software component, to establish the importance of feedback in relation to location sharing & privacy concerns. Phased field trial over four-week period involving initial survey, installation of system, use of system and survey at completion of trial. Boesen et al. (2010) Use of LBS for tracking purposes amongst family members and the resulting implications. Phased observational study of four families over two-week period, which included initial interview, diary recording tracking activities, interview to gauge attitudes regarding diaries and a practical location tracking exercise. Jedrzejczyk et al. (2010) Trial of the ‘Buddy Tracker’ mobile location sharing application to explore the effect of feedback on users’ conduct and therefore impact of acceptance. Field trial conducted over three-week period, focus group and interview. Mancini et al. (2010) Implications of accurate location tracking through trial of ‘Buddy Tracker’ mobile location sharing application. Mobile phone-based field study over three-week period based on experience sampling method and supplementary interview process. Tang et al. (2010) Comparison of the impact of socialdriven (one-to-many) versus purposedriven (one-to-one) forms of location disclosure. Two-week user investigation entailing multiple components, such as an initial survey, location data logging task and interviews based on logs. Fusco et al. (2010; 2011) Impact of location-based social networking (LBSN) on trust for five types of relationships among friends. Focus group methodology, relying on user responses to a number of scenarios. Gasson et al. (2011) Privacy implications of data mining and profiling using GPS data. Tracking exercise conducted over six-week period, involving the collection of GPS data logs. Abbas (2011) offers an observational study methodology that allows for LBS user attitudes to be gauged, the research design of which is based largely on the aforementioned literature (pre-2011) and on relevant socio-technical studies. The research thematically depicts the socio-ethical implications of LBS, demonstrating the benefits and concerns of LBS usage from the perspective of users. The study requested that participants maintain, over a 2-week period, a digital location chronicle, comprising a global positioning system data log, a daily diary entry component and a personal reflection exercise. The primary intention was for participants to observe, reflect and record their experiences during and at the completion of the participant observation, in order to reveal the ensuing collective consequences of LBS usage. The research was essentially built on the LBS usability study conducted by Abbas (2010), and as a result focuses on the Gen-Y or young adult participant group, widely recognised as eager users of technological solutions, including location-based social networking applications. The crux of the research is the significance of LBS usage in a given social context, whereby participants were prompted to reflect on their willingness to be monitored or tracked by a partner, parent, friend, employer and/or stranger. The 2011 study found that the users’ willingness to grant access to location details is reliant on a number of factors; notably, the level of trust within a specific relationship, the perceived privacy threat, the degree of desired control, and the perceived personal security and safety threats. These outcomes are the result of a qualitative, thematic analysis, focusing on the diary entries and personal reflections gathered from participants, and are therefore reliant on excerpts obtained directly from the diary entries and/or user reflections. The results are grouped by relationship type (e.g. partner) and the dominant theme for that type (e.g. trust), and principally exhibit the benefits and concerns of LBS usage in each of the respective relationship types. The benefits and concerns emerging from the study are summarized in Figure 1. The thematic analysis results can further be reinforced through the development of socio-ethical dilemmas in the form of a series of spatial scenarios, based on both the thematic narrative and the corresponding participant GPS data logs. The injection of the spatial element provides graphical scenarios with a multitude of advantages. The spatial component and its significance is the focus of the remainder of this chapter. In ICT research, scenarios are employed to evaluate potential futures and manage “future uncertainty” (Bria et al. 2001, p. 26). As such, and in the context of technology and telecommunications, Bria et al. (2001, p. 26) define a scenario as “a tool to explore a possible, plausible future by identifying key technical and social developments required for it to be realized.” It is not to be used as a means of forecasting the future, but rather for developing an appreciation of a future state of affairs. While personalized LBS applications offer recommendation and prediction features to users (Bao et al. 2015), Camponovo et al. (2005:3) states that scenario planning, unlike the traditional form of forecasting, is useful for examining “a broad range of potential futures”, as opposed to limiting the assessment to a single possibility. In the information systems discipline, specifically in relation to systems development, scenarios are valuable in that they provide a way in which system complexities can be resolved and analyzed (Alexander, 2004). Furthermore, scenarios can be presented in forms ranging from simple stories through to complicated analyses. Fundamental to all forms of scenarios are that they are built on a series of actions and involve storytelling (Alexander 2004). Story-based scenarios have been used in studies relating to the ethical and social implications of technology for many years, for example, in the fields of computer ethics (Artz, 1998) and artificial intelligence (Epstein, 2000). Significant to this chapter, scenarios have been favored in previous LBS-related studies. For instance, Perusco and Michael (2007) rely on scenarios for the explanation of a possible future state in relation to LBS applications. The authors present their scenarios in short-story format, in order to reveal the ethical challenges associated with LBS, employing the Track, Analyze, Image, Decide, Act (TAIDA) scenario-planning framework, whilst analysis adheres to the deconstruction approach (Perusco and Michael 2007). Dobson and Fischer (2007, p. 320) also present “visions of the future”, in which two conflicting scenarios are offered, exploring the “beautiful” and “dark” visions that can possibly be achieved with the use of digital and human tracking technologies. Other relevant studies also feature scenarios. For example, Sheng et al. (2008, p. 355) adopt a scenario-based approach in order to examine “the emerging u-commerce [ubiquitous-commerce] phenomenon”, addressing prospective issues that have not yet materialized. Damiani et al. (2007) outline an LBS usage scenario to examine LBS security requirements. Patel (2004) provides a scenario concerning location tracking of teenagers. Hansen et al. (2005) explore two healthcare-related scenarios relevant to location-aware applications, and Tatli et al. (2005) describe a number of LBS use case examples, in order to assess the associated security challenges. Ghinita (2013) makes use of scenarios and usability contexts to highlight the potential for LBS applications to be privacy-invasive. Yu et al. (2015) propose two prototype applications, which detail varying LBS usage scenarios in a University campus setting. 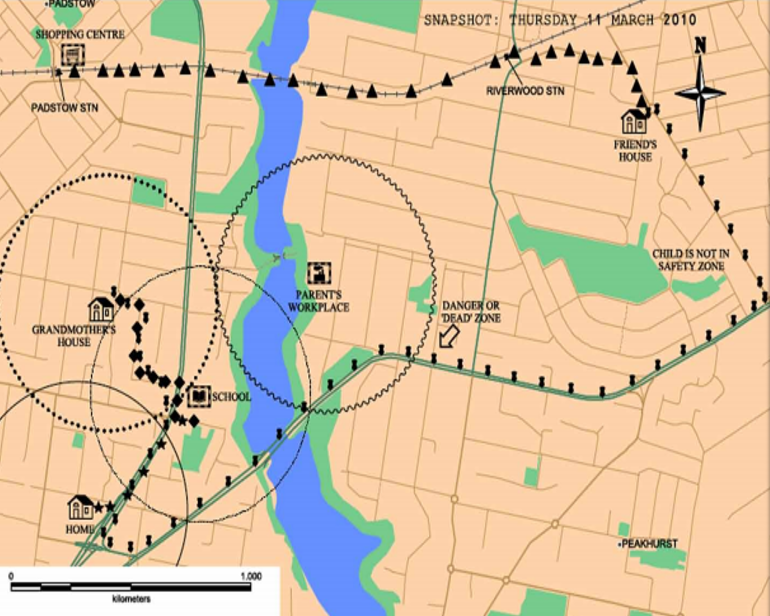 The corresponding scenarios are put forward in narrative form, and are supported by the graphical (map) application prototypes. The intention of Yu et al.’s work is to identify the power of predictive LBS applications in encouraging ‘meet-up’ opportunities based on the relative location of individuals. Additionally, Aloudat (2011) made use of vignettes in a survey of user attitudes regarding the deployment of LBS in specific emergency situations, producing scenarios that represent LBS in both a positive and a less desirable light. In these studies, the scenarios, visions and use cases, were created to provide insights into various aspects of LBS and location-aware applications. As such, the scenarios were forms of input or data that required further analysis. The fundamental contribution of this chapter, however, is that the scenarios are the result of the spatial analysis of participant location chronicles, enabling practical reinforcement of the thematic results summarized above, and in greater detail in Abbas (2011). The spatial analysis process is detailed in the following sections. In an article examining the varying methodologies and methods of spatial analysis, Baur et al. (2014) provide an in-depth critique on the idea of the ‘space’ in spatial analysis, describing space as a “multi-level phenomenon” whereby the varying spatial layers are inextricably linked (p.15). The author argues that a wide range of methods exist for spatial analysis, which currently require some form of assimilation. While this is beyond the focus of this chapter, Baur et al.’s research provides an appreciation for the complexities associated with the concepts of space and spatial analysis, and flags the significance of recognizing that many forms and methods of spatial analysis exist. For the purpose of this chapter, spatial analysis is defined as a technique whereby a geographic information system (GIS) application is utilized in the analysis of spatial data. Taylor and Blewitt (2006:8) define GIS as “the overall name for a continuum of systems ranging from those that display maps for visualization purposes... to those that provide very powerful spatial and statistical analysis of spatial and related data and those providing full immersive virtual environments...” With respect to this investigation, spatial analysis activities were conducted using MapInfo Professional, a “mapping and geographic analysis application” that offers “location intelligence” capabilities (Pitney Bowes, 2012). Spatial analysis “ranges from a simple query about the spatial phenomenon to complicated combinations of attribute queries, spatial queries, and alterations of original data” (Chou 1997: 15). This investigation involved conducting spatial queries through the manipulation of the raw GPS logs in order to deliver scenarios that were supportive and representative of the socio-ethical narrative resulting from the thematic analysis process detailed in Abbas (2011). A phased spatial analysis process was devised to ensure the consistent and systematic creation of the spatial scenarios. The stages of spatial analysis (see Figure 2) adopted for this research included initial manipulation, obfuscation, computation and output, devised using relevant literature and the MapInfo software application. Initial manipulation was the preliminary stage of the data analysis process and it focused on the preparation of raw participant GPS data logs. This stage involved selecting participant data logs containing sufficient records and exporting those logs into CSV file format to be utilized by MapInfo. The CSV file was then imported into MapInfo by creating the relevant database table. The subsequent stage involved the obfuscation of participant data in order to maintain location privacy and to ensure that the data cannot be linked to a specific participant or individual. Obfuscation is a necessary technique that involves the intentional degradation of location information quality, for the purpose of protecting privacy (Duckham and Kulik 2005). Brush et al. (2010) examine the usefulness of various obfuscation methods, and identify five distinct types of obfuscation. These include, deleting, randomizing, discretizing, subsampling and mixing. Adapted from the work of Brush et al. (2010), Table 2 summarizes these obfuscation methods. With respect to LBS the obfuscation of location details must attempt to balance the location privacy of the individual with functionality/usefulness (Duckham and Kulik 2005). In the context of this investigation, however, maintaining an acceptable degree of location quality (for functionality purposes) was not a significant issue as the focus was predominantly on the creation of scenarios supporting the thematic results of the observational study. As a result, a combination of four defined obfuscation techniques was employed, namely deleting, randomizing, subsampling and mixing. Discretizing did not apply due to the fact that it would detract from presentation on the two-dimensional maps presented in this chapter, and potentially affect the ability to comprehend the depicted scenario. Deleting: Involves the removal of data within a certain level of proximity from an individual’s home or other significant locations. Randomizing: Entails the random movement of GPS data points by a specified amount in order to conceal exact location. Discretizing: Conceals exact location in favor of providing a square or region in which the actual location exists. Subsampling: Involves selective removal of data points to create deliberate gaps in location information, providing only partial details of a particular route. Mixing: Entails combining GPS data of multiple individuals within a specified reason, deliberately creating a level of confusion. 4. Inserting all additional labels, titles and aesthetic details to result in a comprehensible layered map. It should be noted that this exercise was chiefly concerned with displaying each scenario in the most simplistic and understandable form, rather than on justifying the selection of specific computational methods. The final stage within the spatial analysis process was output in which the layered maps were exported into a two-dimension map as illustrated in this chapter, with each map representing a single scenario. The following scenarios are established as representative of the socio-ethical dilemmas pertaining to LBS. They are intended to reinforce the thematic mapping, and to allow for further investigation of LBS socio-ethical implications by exploiting the potential of spatial mapping. The scenarios represent a variety of LBS usability contexts, ranging from those generally perceived by observational study participants as positive and involving less risk, through to less desirable notions entailing increased risk levels. The risk levels themselves are the standard risk categories adapted from Emergency Management Australia (2004), and range from the low/ minor risk level to the extreme/catastrophic form. The corresponding scenarios cover consumer (monitoring of family and friends), business (employee monitoring), and government (emergency management) LBS applications or usability contexts, thereby ensuring that a comprehensive set of scenarios is representatively portrayed. 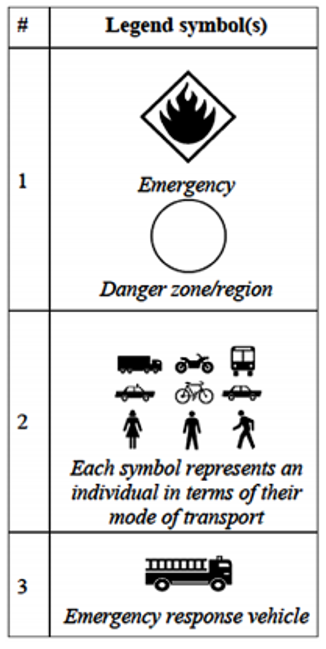 Figure 4 illustrates the socio-ethical scenarios and the associated risk levels. The spatial scenarios are portrayed below in a geographic information systems map format and contain the following components: the sequence of events in each situation (narrative), the equivalent map legend, and the actual spatial scenario modelled using participant GPS data logs. 1. On Monday morning, 15th March 2010, a bush fire is blazing near the University of Wollongong, Australia. At 8:33am, the danger zone is identified depending on distance from the fire and its severity. 2. Emergency services personnel receive timely information from location enabled mobile devices in the vicinity. Individuals within the defined danger zone receive frequent alerts and evacuation procedures based on proximity to an emergency zone, and other factors such as mode of transport, speed and direction. 3. Emergency services personnel initiate their response using the provided information, and the situation is managed in the appropriate manner. 1. 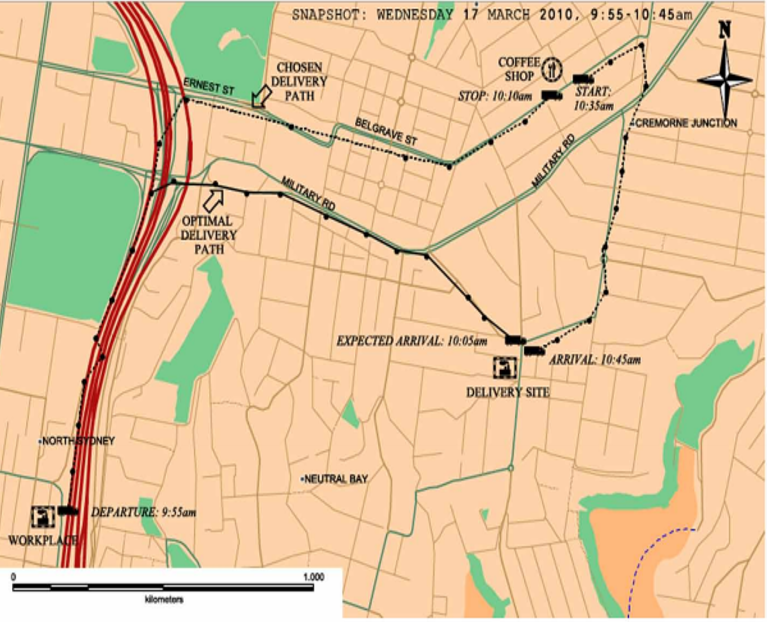 On Thursday 11 March 2010, a child makes various journeys throughout the day, such as attending school between 9am and 3pm, going from school to grandmother’s house for after school care from 3pm to 4pm and travelling to a friend’s house from 4pm to 5pm unaccompanied. At 5:30pm, the child departs the friend’s house and travels by train to a local shopping center, remaining there until 7pm. 2. The child is equipped with a GPS wristwatch that records their whereabouts and journeys made throughout the day as a set of geographical coordinates. The location data, through a real-time feed, is transmitted to the corresponding subscription-based LBS application and updated on a map that contains defined safety zones within a certain distance from specified points of interest. 3. Throughout the day the parent frequently logs into the LBS application from work/home and views whether their child has departed from a defined safety zone at particular time. 1. A catering organization prides itself on the timely delivery of orders and the quick dispatch of delivery vehicles when an order is placed. As such, the organization has fitted all employee vehicles with GPS devices to coordinate daily deliveries. 2. On the morning of Wednesday 17 March 2010, a complaint is received from a loyal customer that their delivery has not been made on time. The employer, from the office, observes the GPS data trail of the respective vehicle (and employee). 3. The employer notes that the route taken by his subordinate is not the optimal path, but rather an alternate route, and that the order has been delivered some forty minutes late. Upon retrospectively analyzing the location data, the unproductive employee is identified, as the employer notes the unexpected stop-off at a nearby coffee shop outside designated lunch hours. 1. A wife is suspicious of her husband’s behavior; there have been many hours spent at work recently, less time for the children, and she remains puzzled by her partner’s failure to return home on his lunch break, which is part of their typical daily routine. Her husband claims that work has been busy and there is rarely time for lunch breaks outside the office. 2. The wife, fed up with the deteriorating situation, installs location-tracking software on her husband’s mobile phone, and is able to monitor his daily activities and journeys. This includes the journey to the childcare center in the morning to drop off their toddler, followed by his path to work, and back home in the afternoon. 3. Upon monitoring her husband’s location chronicle via an online system for a week, the wife notes her partner’s late arrival to work and repeated daily trips to the local shopping center. On Thursday 18 March 2010, the wife decides to surprise her husband on his lunch break at the shopping center and confront him with his location data log, demanding an explanation. 1. The stranger identifies the victim, who lives within close walking distance of his home. The stranger has, on many occasions, attempted to capture the attention of the individual, but all previous efforts have failed. 2. A GPS tracking device is covertly installed under the victim’s vehicle in the early hours of the morning. 3. The stranger consistently views the location of the victim, noting a pattern on Wednesday, Thursday, and Friday nights, as the victim can be found taking a similar path between 9:42pm and 9:53pm. This information has set the stage for a ‘chance’ meeting away from the victim’s home. The LBS observational study involved an examination and presentation of the socio-ethical dilemmas pertaining to LBS usage. Through the creation of a series of scenarios, multiple usability contexts were evaluated and compared. The authors use this public consultation process with prospective consumers/users as a basis for influencing LBS regulatory choices and policy. For instance, Figure 15 depicts the collective user perspective on the need for LBS regulation. The scenarios, and associated thematic analysis summarized earlier in the chapter, suggested that in regulating LBS, the positive and less desirable usability contexts must be simultaneously recognized and factored into any given LBS regulatory framework. That is, potentially positive uses, such as LBS for emergency situations, must be supported. However, more sinister uses, such as cyber/physical stalking and unauthorized access to location information, should be prohibited by law. Yet, at the same time it is recognized that flexibility and choice for users is paramount and should be maintained in a chosen regulatory framework. That is, any suggested framework must recognize that restricting potentially dangerous LBS solutions from use might prevent legitimate everyday uses of LBS, which is an objectionable outcome. Rather, attention should be paid to supporting regulation in specific instances and usability contexts. For example, the emergency services context is a situation in which regulation may prove necessary, given that emergency and public safety applications affect all citizens. 2. Any proposed regulatory response should incorporate and reflect on multiple approaches to regulation, such as legislation (laws), co-regulation through supporting technological mechanisms (technical guidelines, standards and embedded regulatory instruments), and self-regulation through policies/codes (internal organizational policies/codes of practice and ethical/moral codes of conduct). Only then can a comprehensive regulatory response be proposed that will account for the innumerable usability contexts. Comprehensive and well-considered regulatory regimes understandably take time to develop and enforce, but in the meantime there are immediate benefits to be garnered from the results presented throughout this chapter. These include, in the first instance, educational materials and public awareness campaigns based both on the thematic and, importantly, on the spatial analyses. It should be noted that while the spatial (map) scenarios presented within this chapter are two-dimensional for illustrative purposes, they are in actual fact layered three-dimension maps that may be also be displayed in an interactive manner. This is particularly valuable for educational purposes in that the full potential of LBS applications becomes apparent. Secondly, the results of the observational study can be utilized as further input into wider consultative processes to encourage collaboration amongst industry stakeholders. An example established by the authors is a discussion paper (refer to Appendix 1) that transforms the spatial scenarios into an equivalent series of storyboards (see Figure 16) for consultation by industry and government stakeholders. The discussion paper and associated consultation process was intended to provoke responses from industry and government participants regarding the need for LBS regulation in Australia based on the identified socio-ethical dilemmas. As such, the storyboards range from the positive through to the less desirable uses of LBS, and offer a simplified introduction to the various LBS usability contexts. They also provide valuable information for developers of LBS applications (namely, industry) that may be considered in application development processes. The results from the consultation process are beyond the scope of this chapter. This is nonetheless an example demonstrating the manner in which the outcomes of the LBS observational study can be exploited. It is recommended that the both the thematic and spatial outcomes of the LBS observational study of users be utilized as the basis for future research. It is crucial that further research follow a stringent human research ethics clearance process prior to engaging with LBS stakeholders, and it should be noted that this research1 forms only phase one of a broader study on LBS regulation in Australia. The remaining components of the study include collaboration and consultation with industry stakeholders (phase two) and government agencies (phase three), thereby representing all stakeholders in the LBS value chain. For further reading, refer to Abbas et al. (2013, 2014; 2015a; 2015b), and Abbas (2010; 2011). The three research phases collectively enable the varying perspectives (user, industry and government) to be used as a means of informing policy-making and regulatory processes. As such, there are numerous suggestions for further research. In a broad sense, the research covered the technical, social and environmental issues pertaining to LBS, notably privacy and security considerations. This chapter, in particular, spatially illustrated the LBS socio-ethical dilemmas from the perspective of users in the Australian context. It is suggested that future research examines international/alternative contexts to allow comparisons to be made. Additionally, the study concentrated on Gen-Y users; therefore, it may be valuable to focus on an alternative sample to identify any similarities and/or discrepancies. The theoretical/methodological design of this research was socio-technical in nature, addressing the social, technical and environmental factors in the LBS ecosystem within the Australian context. The process of engagement with participants was largely consultative, based on the unification of socio-technical theory, the social informatics perspective and policy-making approaches. Future research could involve assessing the validity of the process in international contexts and for alternative emerging, particularly wearable, technologies. This can then be supplemented by cross-cultural comparisons. Another important pragmatic direction would involve developing tools and materials to disseminate research outcomes to diverse audiences, an example of which was given in the preceding section. This may comprise awareness/educational campaigns for users, materials to aid in the policy-making and regulatory processes, and design/development recommendations that feed into the establishment of ethically sound LBS solutions. This chapter offered the results of an LBS observational study, which was designed to articulate the socio-ethical concerns pertaining to LBS from the perspective of users. A series of socio-ethical scenarios were presented in spatial (map) format, and covered a range of LBS usability contexts, ranging from those associated with minor levels of risk such as emergency management through to high risk situations such as unauthorized tracking by a stranger. Importantly, the scenarios demonstrated that LBS could be employed in many situations to generate benefits for users and other members of society. However, the covert and unauthorized applications raised serious concerns among the participants. These outcomes are significant as they inform LBS regulatory choices in that they enable user perspectives to be articulated and gauged. The findings significantly stipulate that any regulatory regime must: support positive and prohibit the less desirable uses of LBS, balance flexibility/ choice with protection, regulate specific instances of use, while concurrently enabling technological and industry progression. Further research is required in this domain to ensure that the outcomes of this study are transformed into pragmatic tools and materials for use by various stakeholders. • Pros and cons of location disclosure in commercial, business and government settings. • Security risks associated with “strangers” or “third parties” acquiring GPS data logs or other sensor-based systems. • Social implications of sharing location-based data with your social network. • Policy and regulatory implications of LBS usage. • Role of users in the development of location-based wearable applications. • Importance of scenarios in examining the socio-ethical dilemmas associated with LBS usage. • Striking a balance between positive and less desirable uses of LBS. • What is more important when considering LBS usage: flexibility/choice or protection of location data? Discuss. • Identify one stakeholder in the LBS value chain, and describe their function. • Develop a socio-ethical scenario focused on LBS usage in a given context. Your answer should focus on the sequence of events and on the socio-ethical implications of LBS usage in the chosen context. • Select a commercial LBS application, and critique in terms of the benefits and concerns. Consider design improvements to ensure that the application is ethically sound. Abbas R. Michael K. Michael M. G. (2015a). Using a social-ethical framework to evaluate location-based services in an internet of things world. International Review of Information Ethics, 22(12), 42–73. Alexander I. (2004). Introduction: Scenarios in System Development. In I. Alexander Maiden N. (Eds. ), Scenarios, Stories, Use Cases through the Systems Development Lifecycle (pp. 3–24). West Sussex, UK: John Wiley & Sons Ltd.
Aloudat, A. (2011). 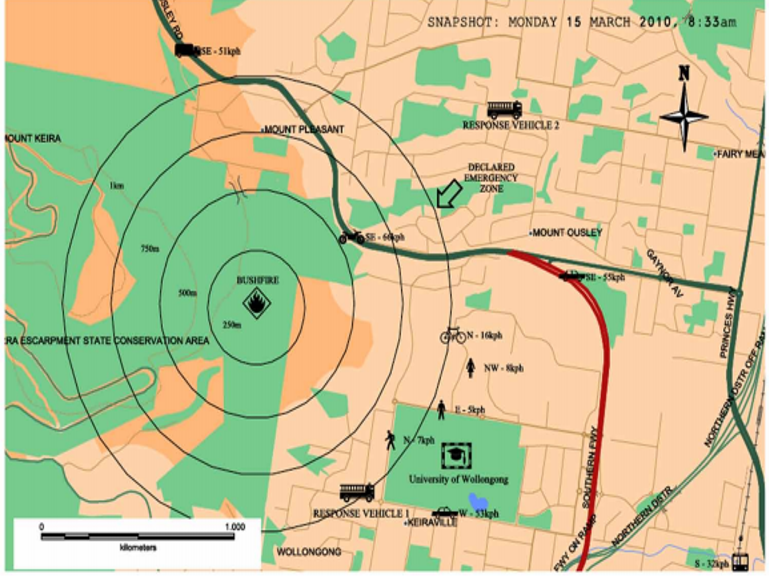 Location-Based Mobile Phone Service Utilisation for Emergency Management in Australia. (PhD Thesis). School of Information Systems and Technology, Informatics, University of Wollongong. Barkhuus, L., Brown, B., Bell, M., Hall, M., Sherwood, S., & Chalmers, M. (2008). From Awareness to Repartee: Sharing Location within Social Groups. In CHI 2008 (pp. 497-506). Baur N. Hering L. Raschke A. L. Thierbach C. (2014). Special issue: Spatial analysis in the social sciences and humanities. towards integrating qualitative, quantitative and cartographic approaches. Historische Sozialforschung, 39(2), 7–50. Bria, A., Gessler, F., Queseth, O., Stridh, R., Unbehaun, M., Wu, J., Zander, J. & Flament, M. (2001, December). 4th generation wireless infrastructures: scenarios and research challenges. IEEE Personal Communications, 25-31. Camponovo, G., Debetaz, S., & Pigneur, Y. (2005). A comparative analysis of published scenarios for m-business. In Proceedings of the Third International Conference on Mobile Business, M-Business 2004. Chou Y. H. (1997). Exploring Spatial Analysis in Georgraphic Information Systems. Sante Fe, NM: Onword Press. Consolvo, S., Smith, I. E., Matthews, T., LaMarca, A., Tabert, J., & Powledge, P. (2005). Location disclosure to social relations: why, when, & what people want to share. In CHI 2005 (pp. 81-90). Duckham M. Kulik L. (2005). A formal model of obfuscation and negotiation for location privacy. Pervasive, 2005, 152–170. Ghinita, G. (2013). Privacy for location-based services, Volume 4 of synthesis lectures on information security, privacy and trust. Morgan & Claypool Publishers. Iqbal, M. U., & Lim, S. (2007). Privacy implications of automated GPS tracking and profiling. In K. Michael & M. G. Michael (Eds. ), From Dataveillance to Überveillance and the Realpolitik of the Transparent Society (Workshop on the Social Implications of National Security, 2007), University of Wollongong, IP Location-Based Services Research Program (Faculty of Informatics) and Centre for Transnational Crime Prevention (Faculty of Law) (pp. 225-240). Mancini, C., Jedrzejczyk, L., Thomas, K., Price, B. A., Bandara, A. K., Rogers, Y., & Nuseibeh, B. (2010). Predators and prey: ubiquitous tracking, privacy and the social contract. In UbiComp 2010. Patel D. P. (2004). Should teenagers get lojacked against their will? : An argument for the ratification of the United Nations convention on the rights of the child. Howard Law Journal, 47(2), 429–470. Sheng H. Fui-Hoon Nah F. Siau K. (2008). An experimental study on ubiquitous commerce adoption: Impact of personalization and privacy concerns. Journal of the Association for Information Systems, 9(6), 344–376. Sun Y. Wang N. Shen X. L. Zhang J. X. (2015). Location information disclosure in location-based social network services: Privacy calculus, benefit structure, and gender differences. Computers in Human Behavior, 52, 278–292. Tsai J. Y. Kelley P. G. Drielsma P. H. Cranor L. F. Hong J. Sadeh N. (2009). Who’s viewed you? The impact of feedback in a mobile location-sharing application. Boston, MA: CHI. Data Log: Record of data over time and in relation to location. GPS (Global Positioning System): A constellation of 24 satellites that orbit the Earth. With the aid of ground receivers, three or more satellites can pinpoint a person’s geographic location between 100 and 10 meters. GPS chipsets can come embedded in various devices, including wearables, mobiles, tablets, etc. Location Chronicle: A sequential record of an individual’s whereabouts. Policy: An enforceable set of organizational rules and principles used to aid decision-making that have penalties for non-compliance, such as the termination of an employee’s contract with an employer. Regulation: The use of rules and limitations to constrain behavior. Scenario: A Tool used to examine a possible future in the form of a sequence of events. Socio-Ethical: Expresses in human judgments our ideas about the ethical nature of the human community. Spatial: Relates to a specific space. Thematic: Relates to a specific topic/subject. User: An individual that employs a particular application. 1 This research was supported under the Australian Research Council’s Discovery Projects funding scheme (project DP0881191). The views expressed herein are those of the authors and are not necessarily those of the Australian Research Council. The University of Wollongong Human Research Ethics Committee (HREC) Approval No is HE09/062. Location-based Services (LBS) provide a means of positioning, tracing and tracking individuals and objects, for purposes such as emergency management, employee monitoring, and consumer convenience amongst others. The LBS industry is characterised by a multitude of vendors, all of whom assume a vital role in the value chain. Stakeholders range from technical vendors involved in the development of LBS, external entities such as government and standardisation bodies, to consumers who utilise the solutions. Our research has thus far recognised the need for extensive collaboration between stakeholders within the LBS value chain in Australia. Essentially, we are attempting to facilitate a consultation process, in which all stakeholders can contribute valuable feedback and comments, in an attempt to address the implications associated with the introduction of location-based services, and help shape the future of the industry. The ultimate objective of this process is to produce a detailed report which examines the factors that will contribute to the success of the LBS industry. This report can be used internally by your organisation to drive the LBS design and development process, allowing you to recognise the conditions and requirements for ethically-sound LBS applications. The research will specifically focus on the varying uses or applications of location-based services in the Australian market, and consider the implications of each application. As such, we request that you to consider the scenarios presented below in story-board format. The interview process will allow you to provide commentary and opinions regarding the implications of each scenario, and discuss your organisation’s approach where relevant. • To schedule an interview, please email using the provided details or wait for our follow-up. • Appended to this paper is a consent form and participant information sheet for your reference.